The next time you find yourself near a vast forest far from human settlements with minimal infrastructure in Malaysia, get your camping gear out and spend a few nights in the forests with a group of nature lovers. If you’re lucky, have sharp eyes and walk far enough, you may just find an amphibian or mammal species yet to be discovered by scientists. And if you are really dying to name more new amphibian or mammal species after that special someone, head into the Amazon or Central Africa to improve your chances! A new study by Giam, one of Rimba’s researchers, found that tropical moist forests of the Neotropics, Afrotropics, and Indomalaya (this includes Malaysia!) are likely harbour the greatest numbers of undescribed species. This paper was recently published in the prestigious international journal, Proceedings of the Royal Society B.
Giam and his colleagues devised a mathematical model of species descriptions that accounts for the uneven amounts of effort spent over the course of history to describe new species. When the data was plugged into the model, they found that probably at least 3050 amphibian and 160 land mammal species have yet to be discovered on this planet! These values represent 33% and 3% of the current species total for amphibians and land mammals respectively. Scientists are still discovering species even after 250 years of taxonomic classification, but many of the still unknown species on our planet may go extinct before being documented due to conversion of natural forests. 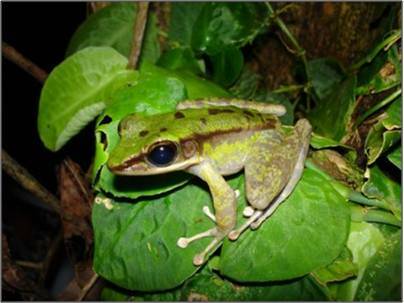 One of Malaysia’s recently discovered amphibians, Rana monjerai (Matsui & Jaafar 2006), found on top Mount Jerai in the state of Kedah.